The list has six candidates from Gujarat, six from Uttar Pradesh and the remaining from Rajasthan. With this, the party has so far declared 293 Lok Sabha candidates. 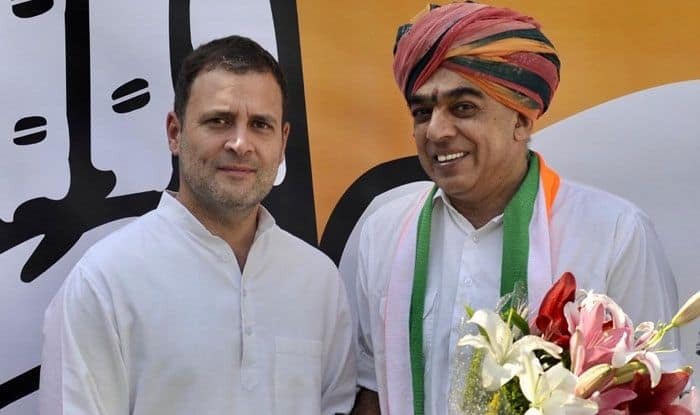 Congress on Thursday declared 31 more Lok Sabha candidates fielding Rajasthan Chief Minister Ashok Gehlot’s son Vaibhav Gehlot from Jodhpur and former MPs Manvendra Singh from Barmer, Jitendra Singh from Alwar and Jyoti Mirdha from Nagaur. The list has six candidates from Gujarat, six from Uttar Pradesh and the remaining from Rajasthan. Vaibhav Gehlot will contest against Union Minister Gajendra Singh Shekhawat in Jodhpur while Manvendra Singh, son of former Union Minister and BJP leader Jaswant Singh from Barmer, where the BJP has not yet announced its candidate. Manvendra had joined the Congress ahead of Assembly polls in Rajasthan last year. He contested against then Chief Minster Vasundhra Raje but lost. Jaswant Singh, who was a minister in the BJP-led Atal Bihari Vajpayee government, hails from Barmer but was denied ticket by the BJP in the last Lok Sabha elections. Jitendra Singh had been a minister of state for home during the UPA government. Others given the ticket include Ramnarayan Meena from Kota, Namo Narayan Meena from Tonk, Raghuveer Singh Meena from Udaipur and Savita Meena from Dausa. The party has fielded former MP Badri Ram Jakhar from Pali parliamentary constituency against Union Minister P. P. Chaudhary. In Gujarat, the Congres has given ticket to Jitu Chaudhary from Valsad and Jagdish Thakor from Patan. In Uttar Pradesh, it has fielded Pankaj Niranjan from prestigious Phulpur seat, Maj J. P. Singh from Sambhal and Niaz Ahmed from Deoria. With this, the party has so far declared 293 Lok Sabha candidates.